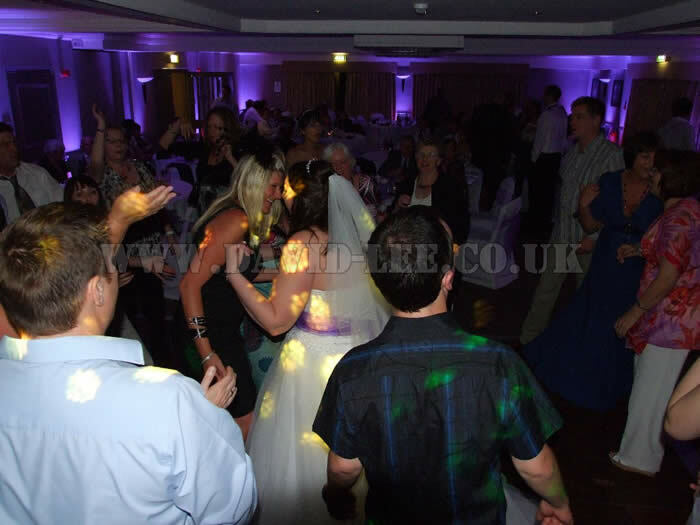 I was hired to perform at the Village Hotel Cheadle Cheshire, in September 2010, and on this occasion I was asked to supply the Ceremony music, Dinner background music, Microphones for the Wedding speeches, Full venue up-lighting, as well the disco in the evening. It was a long day but well worth it. 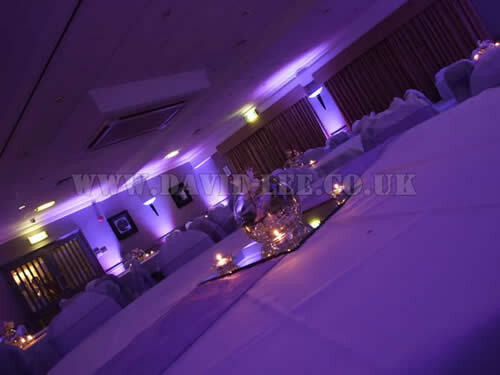 As you can see from the pictures everyone enjoyed the night time, and the lighting worked a treat in the Wedding venue function room. 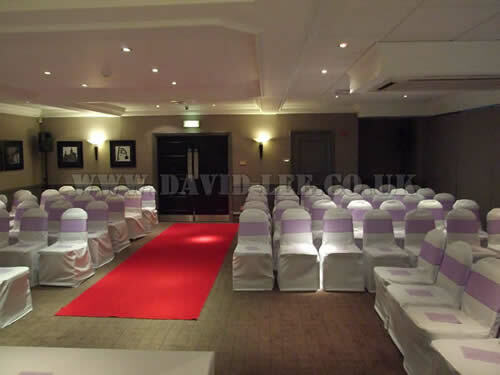 As you can see from this picture, the 2 speakers for the ceremony music neatly tucked into the corners, so as allowing the guests to access the room without any hindrance from the equipment. 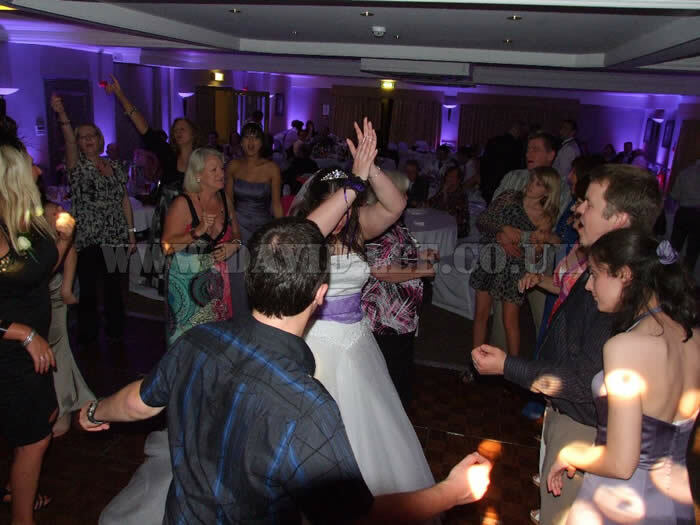 On this occasion the Bride had chosen the Foo Fighters - Everlong (Acoustic), to walk down the aisle to. You too can have the song you want played from the part that you want, so you can walk down the aisle to the song you want! 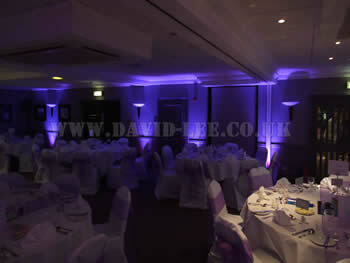 Here we can see the stunning effect of the venue up lighting in the wedding function room at the Cheadle Village Hotel. 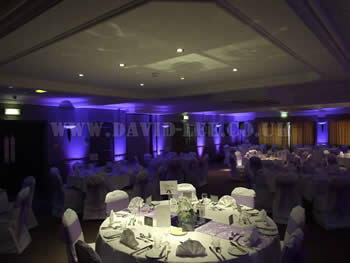 It was programmed to Cadbury's Purple as per the brides request as I have to say the pictures don't do it justice. 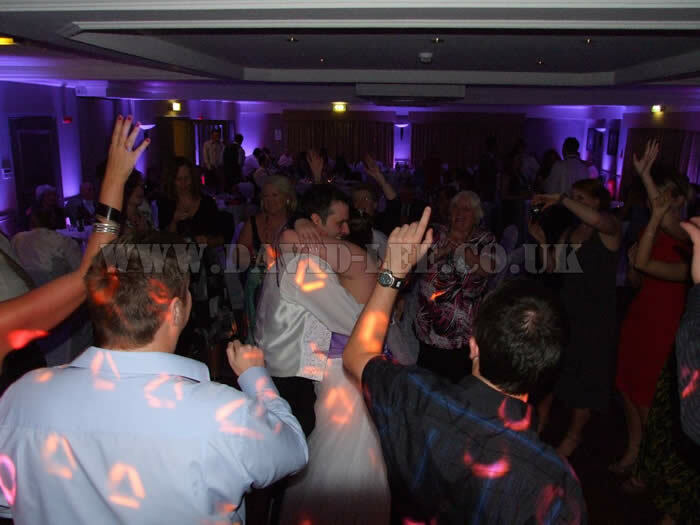 In the 2 pictures directly below you might be able to see the the speakers that we used for the ceremony were again used to but re-arranged so there was a wide spread of music, without having to turn the volume up. 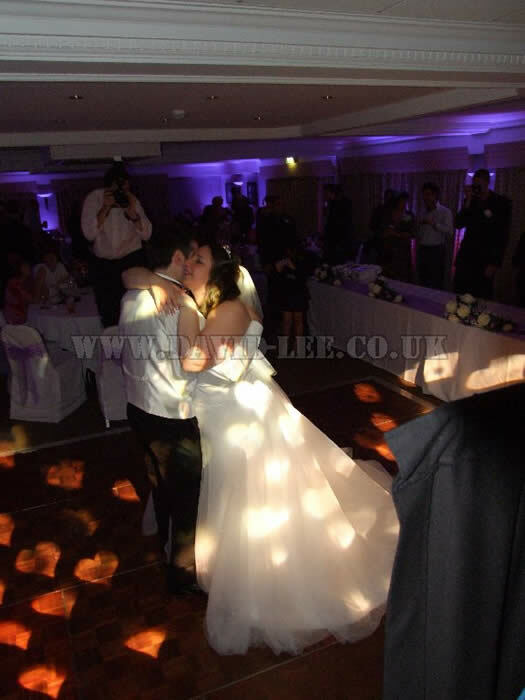 On this occasion the Bride and Groom had chosen an acoustic set, and swing, jazz, type music for during the meal. I find having some background during the meal takes the edge of the atmosphere, otherwise all your left with is the sound of cutlery on porcelain. 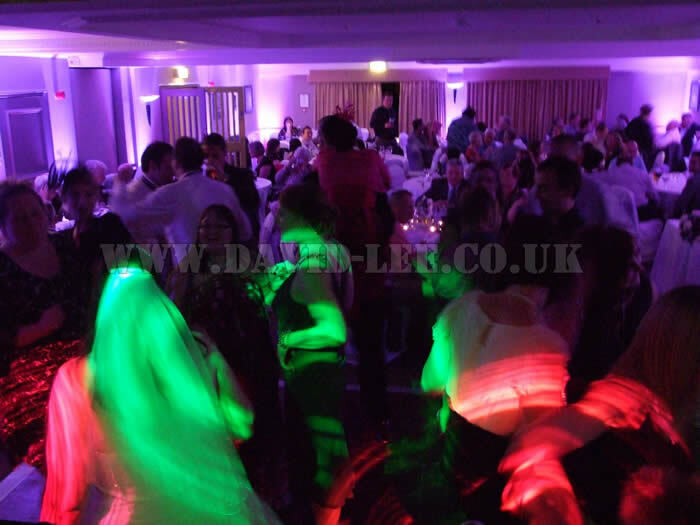 Then on to the speeches, and with the speakers all ready in place, a wireless microphone was placed on the head table, and everyone throughout the room could hear all the well chosen, and loving words that was said. 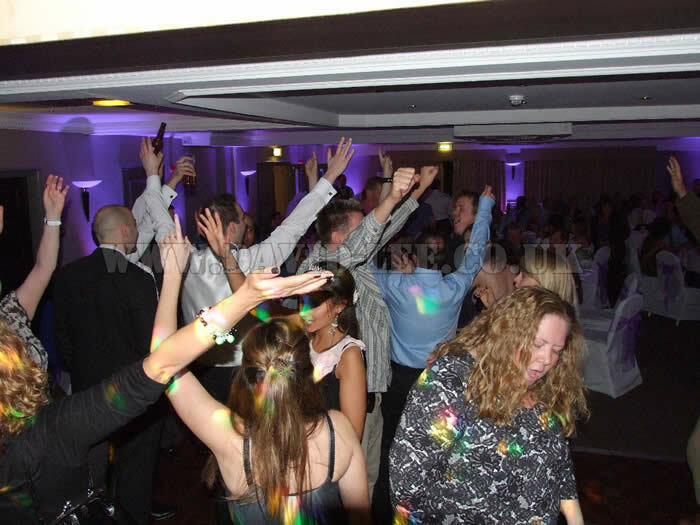 The Bride and groom catered for everyone with there music choices on line, but they had insisted on a little bit of heavy metal for themselves. And I duly obliged. 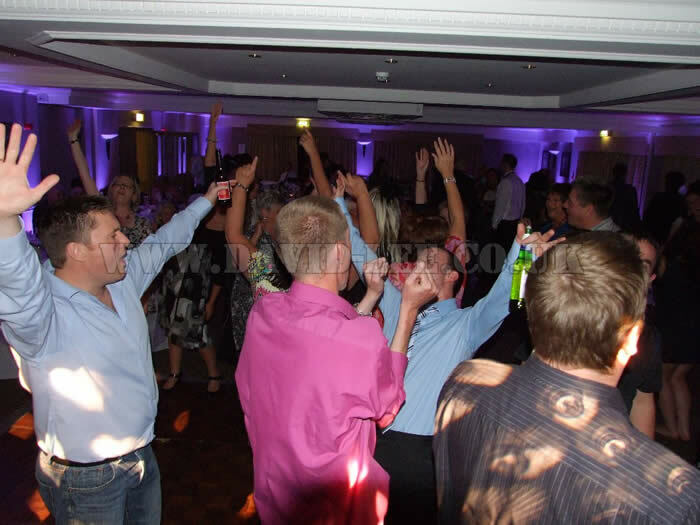 Making sure nobody left without having visited the dancefloor for sustained periods of time. As I mentioned it was a long day, but as you can see from the pictures and especially the last one, everyone including the Bride and Groom thoroughly enjoyed what was a great day, and one i'll remember for a long time.